There are many uses for the Ten Degree quilts. One is using it as a wall hanging. So how do we hang it? 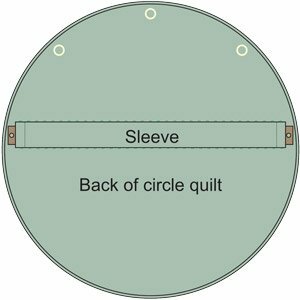 - Measure your diameter of the finished quilt. - Cut a 6" wide strip of backing fabric the same length as the diameter of the quilt. - Sew a 2" hem on both ends of the strip. - Fold the strip in half and sew into a tube and tun inside out. - Hand sew the pocket on to the backing of the quilted piece. - Sew on three drapery rings around the top edges. - Cut a thin flat board to fit into the sleeve with two holes on each end. - Secure the board to the wall with small nails. - Hang to the wall with pins placed in the drapery rings.